Gunner Albert Edward Robert Mee, born in 1884, was the youngest son of Henry and Sarah Ann (née Cooper) Mee2. He was a married man and lived with his wife Edith (née Morris) and their two children, Albert (Sonny) and Clara, at 27 Middleton Street Beeston. A native of Beeston, prior to joining the colours he worked as a bricklayer's labourer for Mr G Brough, in the building trade, from premises on Marlborough Road Beeston3. He enlisted early in January 1915, and soon afterwards was sent to France. After a short spell of three months, he was transferred to the front at Salonica. He remained there until the beginning of December 1915 when he contacted Enteric fever, and was hospitalised in Malta, later returning back to England where he received further treatment in Manchester. This illness caused him to have a respite from the front line until May 1917 when he returned to the front in France. Gunner Mee was severely wounded on 6th December 1917 near Hazebrouck, Belgium and died in No 53 Casualty Clearing Station some four days later. Outtersteen Communal Cemetery Extension - Outtersteene is a village about 5 kilometres south-west of Bailleul. 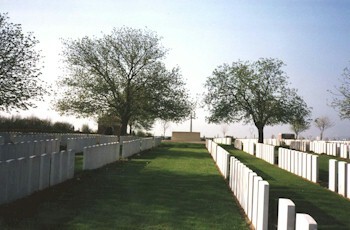 The Communal Cemetery Extension is north-east of the village on the road to Bailleul. Outtersteene was captured by the III Corps on 13th October 1914, but no Commonwealth burials took place there for nearly three years. In August 1917, during the third battle of Ypres, the 2nd, 53rd and 1st Casualty Clearing Stations came to Outtersteene, and the first and last of these remained until March 1918. The hamlet was captured by the Germans on 12th April 1918 and retaken by the 9th 29th and 31st Divisions, with the ridge beyond it on 18th/19th August, but the Cemetery was not used again during the hostilities. After the Armistice, graves were brought into the Cemetery Extension from the battlefields surrounding Outtersteene and from certain other small cemeteries. 2Henry and Sarah had at least seven children - Joseph (b. about 1870), Henry (about 1872), Frances R (about 1878) Richard (about 1883), Albert Edward Robert (1884), Mary Ann (1886 and Alice (about 1889). Henry began as a labourer, sometimes at the local market gardens but, by about 1888, he had started up as a milk seller, apparently from premises on Chilwell Road or Hall Croft. In 1891 (Beeston 1891 Census - Piece 2671 Folio 43 - 23 Chilwell Rd) he was being assisted in this by his wife and their daughter Frances (then aged 13). Henry senior died in 1894, aged 50. By 1901 (Beeston 1901 Census - Piece 3153 Folio 63 - Chilwell Rd), his widow had started up a business as a fishmonger and their oldest son was operating as a farmer and greengrocer, apparently from adjacent premises. Albert Edward was then a cow man on a farm, possibly with his brother. 3At the time of the census in April 1911, Albert (then age 26) and Edith (then age 25) had been married for a year and were living at 27 Middleton Street with Edith's married sister Rose, her husband and baby son as lodgers. (1911 Census of Beeston - Piece 1223 RD429 SD3 ED2 Schedule 137). 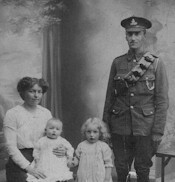 Clara, Albert and Edith's daughter, was born towards the end of 1911 and her brother Albert (known as Sonny), towards the end of 1914.